Let me start off with this: I am unconvinced that a single, breathing real live person is genuinely "outraged" that Starbucks is using solid red cups for the holidays. You might be surprised at this assertion because the internet has turned into a full on blaze of headlines proclaiming the opposite. US Weekly: "Starbucks' Plan Red Holiday Cups are Causing Outrage Among Christians"
Mirror: "Outraged Christians boycott Starbucks over 'politically correct' Christmas red cup design"
Buzzfeed: "Some Christians Are Super Offended By The New Starbucks Red Cup Design"
Rawstory: "Bristol Palin: Starbucks cups ‘are an attempt by the left to make Christians look stupid’"
Forbes: "Here's Why The Drama Over Red Holiday Cups Is A Win For Starbucks"
No matter which article type you find yourself scrolling through, though, you're left with the impression that this is an actual thing and that real, live people care about it. It appears that this "controversy" can be traced back to a Breitbart post that reads as pretty obviously satirical to me. From there, it was latched onto by evangelical internet sensation Joshua Feuerstein who went on one of his wildly popular rants filled with fast talking and odd intonation. 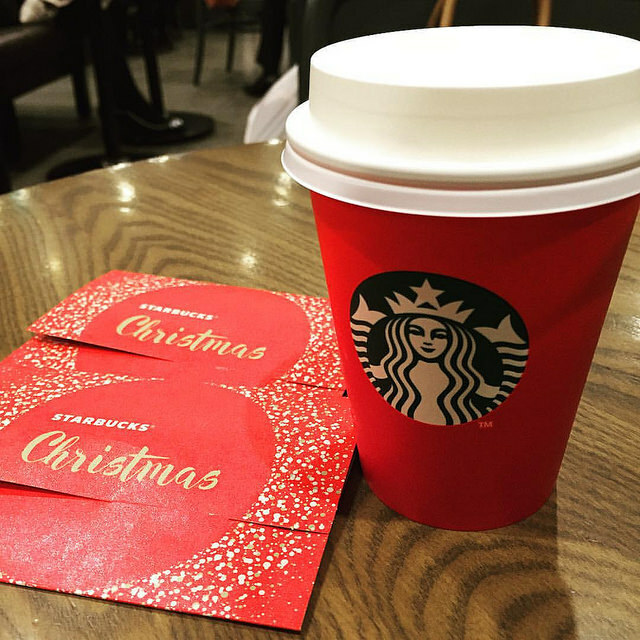 He challenges his users to "start a movement" by having Starbucks write their names as "Merry Christmas" and take a selfie using the hashtag #MerryChristmasStarbucks. He also brags about carrying his gun into the store. I scrolled through tons of posts to get to that video, and many of them were posts promoting the "movement" against Starbucks, bragging about the rise of the #MerryChristmasStarbucks hashtag, and otherwise egging on his followers (which, to be fair, do amount to almost 2 million). My point here is that if anyone had a PR stunt in mind with the red cup "controversy," my money's on Mr. Feuerstein. A closer look at his website indicates that people can become "partners" in his mission by donating money to him. He's got an immediate motive for getting some extra eyeballs to stray his way. What does all of this mean? I have no idea. I don't think anyone* is genuinely upset about Starbucks' holiday cup selection, though. Maybe we just like being outraged so much about others' "outrage" that we're willing to throw critical thinking to the side to join in on the fun. *Okay. There's probably someone who is upset because there is someone upset about literally every thing. But I definitely don't think there's some kind of mass outrage that warrants this many legitimate news sources writing stories.